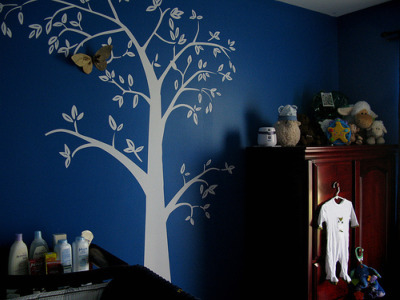 The tree is a wall decal from Wall Slicks. The sheep print on the armoire is from an etsy shop. The crib bedding is Sweet Lambie from Pottery Barn. As a focal point, the wall decal is truly superb. I love the lamb theme of the room too. The butterfly adds 3D effect to the wall art. It's a nice touch.